We were blessed this summer to be able to host three more groups. 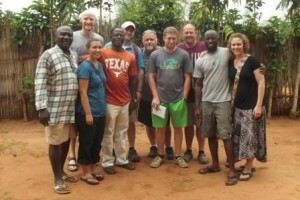 The first was a team from one of our supporting Churches, Seymour Heights of Tennessee. We were pleased to receive John Handlos, Christine Handlos, Jerome Princeton, Laine Coey, Anna Krug, Emaleigh Krug, Brandon Handlos, and Casey Handlos. This team jumped in with us in the clinic work, distributing eye glasses sent back with them from our Texas team who visited us earlier this summer, helped us plant trees on the farm, visited several villages in order to do outreach to the children as well as interact with Church members and idol priests alike. This group definitely pushed outside of their comfort zones and were always up for the next challenge. A huge thanks to our family at Seymour Heights Christian Church for partnering with us in a whole new way by coming to work alongside us here in Togo. Next we were excited to welcome Brittany’s Father, Darrell Creasy and sister, Brandi Allen. It was a joy to have them here for their stay and we all enjoyed showing them the various parts of our mission and serving along side them. Brandi has been here on two previous short term trips so it was great to have her back for another visit and it was really fun to have Mr. Darrell here for the first time too! 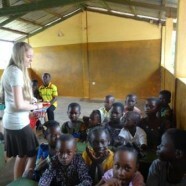 They were brave to try several African foods and bounce around with us up and down to the villages while we do outreach! Our last group this summer was from Lake Christian Church of Palmyra, Virginia. We were glad to host Chris Long, Aaron Stokes, Aaron Hurd, Jake Miller, and Sean Suttles. 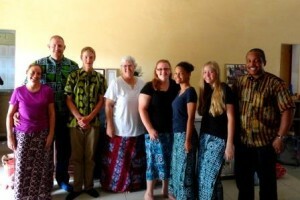 Lake Christian Church has started partnering with us over the last couple years and we were excited to see this trip come to fruition as they have been discussing sending a group for the past couple years. This group was a lot of fun and definitely had a sense of humor but also had huge hearts to serve and share the love of Christ. We were blessed by their time here and look forward to how this partnership will continue to grow. We are thankful for so many partners who support us financially and give sacrificially every month and year. From the bottom of our hearts thank you. We are also thankful for these teams who were able to come to visit this summer so that they will be able to attest to what God is doing here in Togo and learn how they can continue to pray and support the work and be an ambassador to share what is going on in Togo with others. A huge thank you to all of you who helped support them all to come this summer as well. May God richly bless you all! We always count our blessings to be able to have transportation to be able to get out to the villages and surrounding areas here in Togo. The road conditions are truly terrible a lot of times, and it is not a matter of dodging an occasional pot hole but calculating as you drive which pot hole or crater is the best to drive through. The villages we do outreach in as well as the farm are some distance away, requiring us to use these roads often. Before moving here full time in September 2014, I (Sara) never would have guessed how quickly a car could get run down. We were blessed to be able to ship over our Toyota 4 Runner in 2014 and to be able to use it these past couple years. However, the past four to six months we have had to do extensive repairs on it monthly or even more often. The other issue we have often is finding the parts to replace. Even though our car is a Toyota it is still difficult to find parts for it in Togo and we often have to travel to Ghana for larger fixes. You can find parts in Togo but they are not quality and will break quickly. All of this has lead us to the decision of selling our 4 Runner in hopes of replacing it with a more sturdy vehicle that is made for these road conditions. The car we would like to get is also easier to find parts for here in Togo. So currently we are trying to sell our 4 Runner and are hoping to get around $8,800 for it here in Togo. 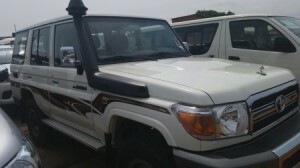 If we can add $23,000 we should be able to get a used Toyota Land Cruiser 76 Series. This car is built a lot sturdier underneath and is supposed to be able to take more of the beatings that our road conditions put out. These funds include all the taxes, paperwork, and insurance (that you have to pay up front when you purchase a vehicle) that will need to be paid up front when you purchase a vehicle here in Togo. All vehicles purchased in the port of Togo come with a very heavy tax which causes this cost of purchasing one to increase significantly. Transportation is easily one of the biggest parts of our budget, but without it, it sure is difficult to accomplish a lot here. We are praying that God would help provide for us to find the remaining $23,000 that needs to be raised in order to purchase the vehicle. If God leads you to help with this need any donations may be mailed to Outreach International (Check made out to Outreach International and “TCM-Vehicle” in the memo). The address may be found below as well. Thank you so much for all that you do as partners and continue to do. This season has also been a busy one for our medical outreach. This summer seems to have actually been a cooler season (which felt great after the very hot dry season!) and we have also noticed an increase in the number of patients and severity of sicknesses at the clinic. A number of large wounds have come through our doors, several of whom have stayed home for several months prior to coming. Often our patients will be turned away from local hospitals as they either neglected their wounds for lengthy periods of time or they attempted to use voo-doo for healing and now have very infected wounds. 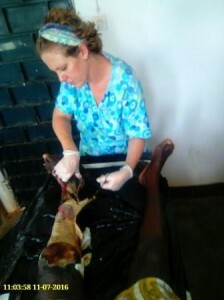 Sometimes they require amputations (which we then refer them to another local hospital for surgery) but other times through a lengthy process of wound care God is merciful to bring healing through what is done by our medical outreach. The other thing we have noticed is an increased number of cases of severely malnourished children. Any type of meat or fish often is more expensive and therefore is often served to the adults first and then sparingly to the children as it is more seen as a privilege. Educating that protein is vital to our bodies and other sources of protein as well is very important here. This is often complicated by unemployment, poverty, and sometimes a lack of value placed on children (until they reach an older age) by society. We have been extending our feeding program, doing more home visits, and educating parents and family members on these issues. The poverty we are seeing in these homes extends beyond a physical or material poverty often though. There is a spiritual poverty visible here, and we are sharing more about Christ and extending His love in hopes to see a complete recovery for Christ. Please pray with us as we are still trying to pray and learn more about how we can most effectively work in this matter. 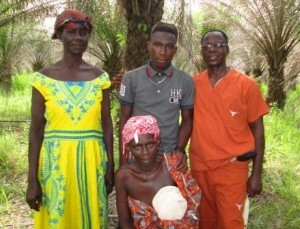 Lastly there was also recently a member of Church of Christ in Denu, Ghana (Aflao) that the local Church here in Vogan partnered with to assist in medical care and expenses. Often cancer is not detected early on, and unfortunately we find cases that are very advanced. After the Church put some funds together Hammer helped take her to the Baptist hospital in Tsiko. They too said that her case was very advanced but were able to supply some medications to help her be a little more comfortable through the process. She passed away on June 26th, 2016. We are thankful that she is no longer suffering. We were also glad to see how the Vogan Church rallied to help assist her in her time of need. Please continue to pray for her family after this loss. For several teams coming this summer that worked alongside us. That we learned from them and they learned from their time here and were mutually encouraged. Mensa’s (one of our leaders who is in training in the simple Church method) wife had a baby this month. Praise God for a healthy boy, Ephriam! Thankful also Dovene got to participate in the naming ceremony (similar to a baby dedication). For provision of a new vehicle for Dovene and Sara and their family. That their old vehicle would sell as well. For continued health and strength as several of our team either are or have been recently sick with colds and/or malaria. 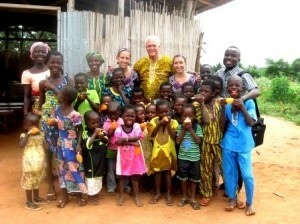 For Gruitzki, Tagan, and Mensa to give their lives fully to Christ.